I was once told that I should sow as many courgette seeds as I think I need. Then give half the plants away and you would still have too many. 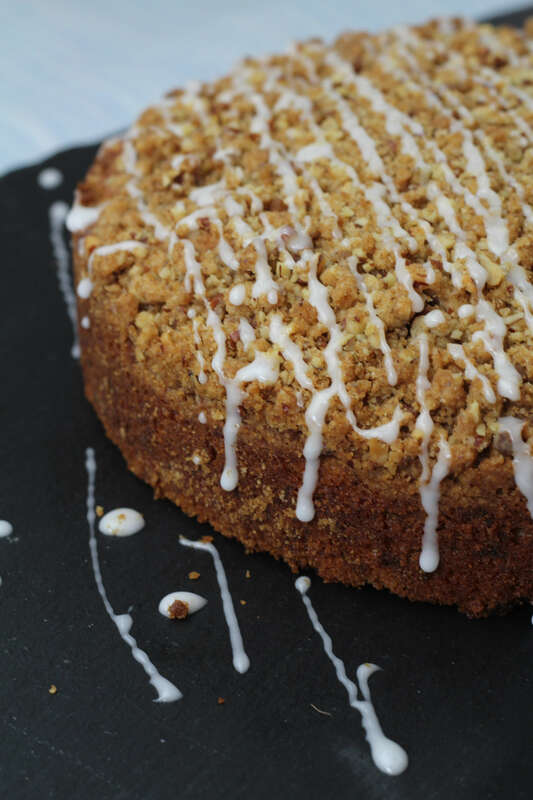 Courgettes are such a prolific crop and as much as I love them as a vegetable with my dinner, they are also brilliant for sneaking into cakes without the kids spotting and for adding moisture. A top tip if planning to use them in cakes is to grow the yellow variety. Then they are even harder for the kids to spot. 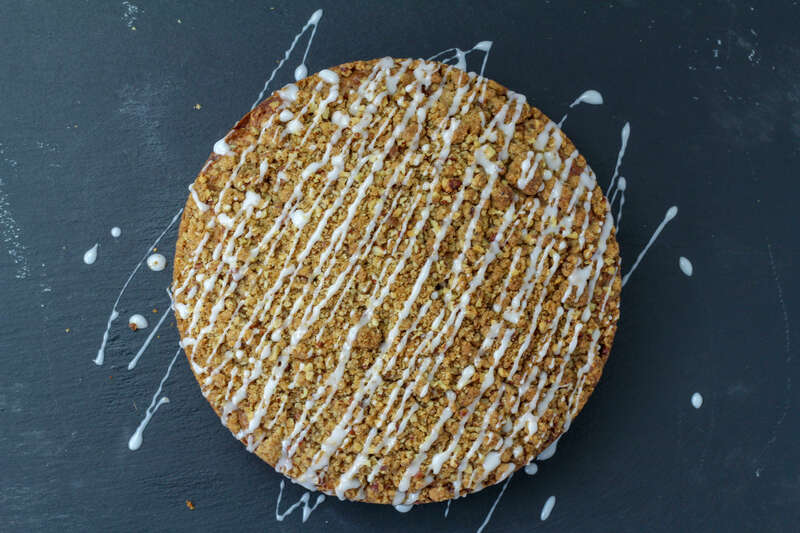 This tropical moist crumble cake makes great use of the courgette to keep the cake deliciously moist with a lovely buttery contrasting crumble topping. The inclusion of banana and pineapple and the lime icing gives the cake a fruity and tropical feel. Perfect for a hot summers day. This recipe featured in Kitchen Garden Magazine, Aug 2018. Butter and line a deep 8 inch cake pan with baking parchment. In a small saucepan, melt the butter on a medium heat and cook for 10 minutes until it turns a nut brown. This will add extra flavour to the cake. Leave to the side to cool. Coarsely grate the courgettes and dry off some of the moisture between some layers of kitchen roll. Drain the crushed pineapple in a sieve. In the bowl of a stand mixer with the paddle attachment or in a large bowl with a hand mixer, beat together the banana, eggs, pineapple, courgette and vanilla until smooth. Then add the cooled butter and mix until combined. In a separate bowl add the flour, sugars, cinnamon and baking powder and mix to combine. Add the dry ingredients to the wet banana mixture and mix until just combined, do not over mix. Pour the batter into the tin and smooth the surface. Mix together the flour, sugar and cinnamon and rub in the diced butter until the mixture forms a fine crumble mix. Add the chopped pecans and mix in. 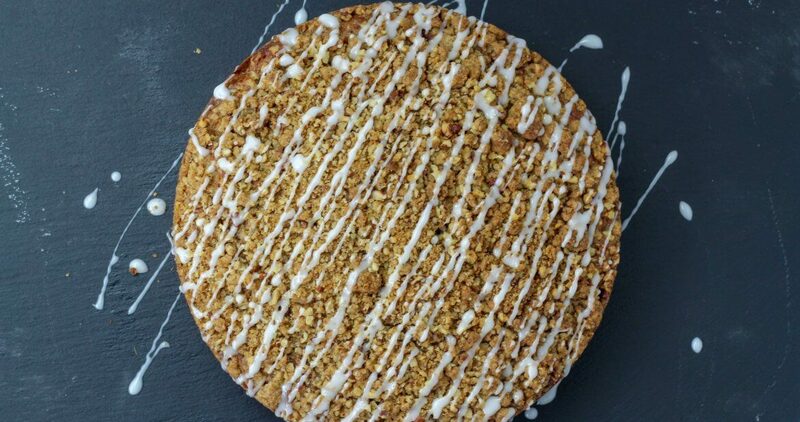 Sprinkle the crumble mix evenly over the top of the cake and bake for 45-50 minutes, until a skewer comes out clean after being inserted into the middle of the cake. If it needs a little longer, cover with foil so it does not burn on top. When baked, remove from the oven and allow to cool in the tin on a rack for about 15 minutes. Then gently turn out onto the wire rack, removing any baking parchment. In a small bowl, gradually add the juice a little at a time into the icing sugar and mix until it becomes a nice drizzling consistency. Using a teaspoon, drizzle the icing over the top of the cake. Tried this recipe with “plain ” flour as stated and it was a pancake ! Made it with self raising flour and it turned out very nice. Just wondering if there is an error on this ingredient, or the quantities of baking powder, I have never made any cake with plain flout even adding larger quantities of baking powder does not seem to equal the ready prepared flour. Unless I have done something else wrong !!! Hi. It is a dense moist cake, more like a moist carrot cake. The liquid content of the fruit and courgettes can make a difference . I wring them out until they are very dry.